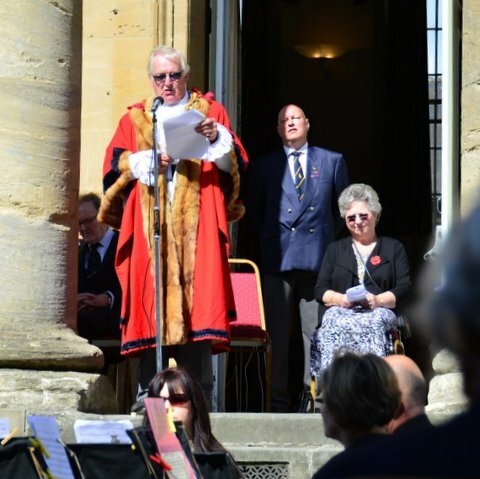 On Sunday 3rd August a Commemoration to mark the Centenary of the beginning of the First World War was held on the steps of the Town Hall in the presence of the Deputy Lieutenant of Oxfordshire Mr David Astor CBE. 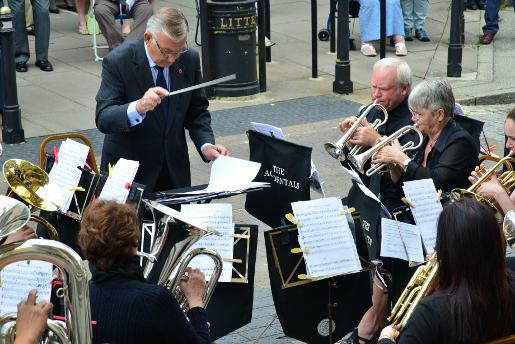 The Commemoration began with the Accidentals Brass Ensemble playing a medley of tunes from the period. 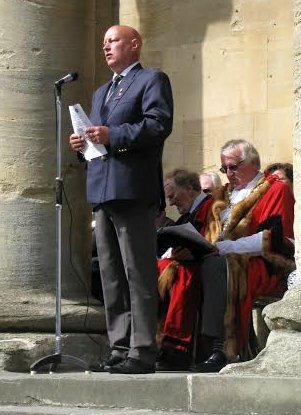 The Mayor, Councillor Mike Tysoe then gave a speech of introduction and talked of the effect of the conflict both globally and locally. 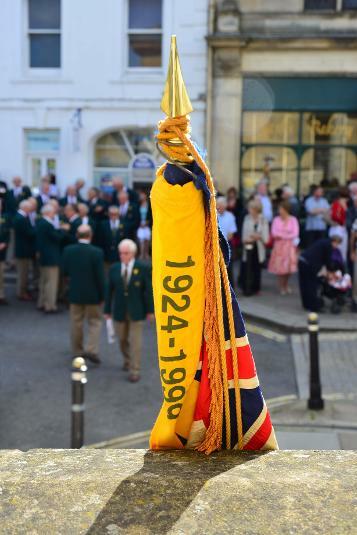 Some 113 men who were born, lived, worked or were associated with the town died whilst in the service of their country, 95 are on the town’s war memorial. There were nine sets of brothers, Mary Benfield of Over Norton lost three of her sons, and a father and son, Charles and Edward Joines, both died. The youngest was 18 and the oldest 59. 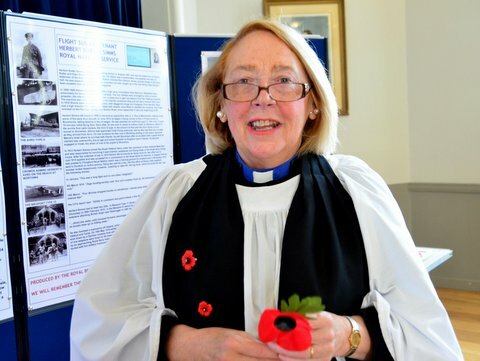 The Reverend Jackie Jones told us about a First World War Padre known as "Woodbine Willie" and read one of his poems. She then read the Lords Prayer. 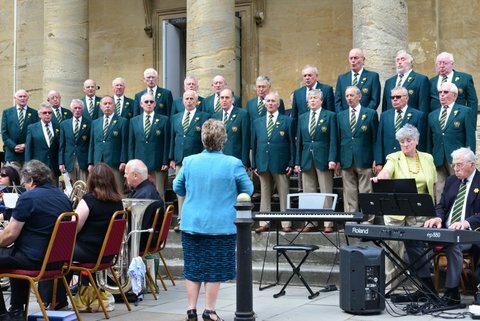 Next we had the first of two numbers from the Rhythm is Life choir singing a very moving version of "Keep the home fires burning" written by Ivor Novello in 1914. 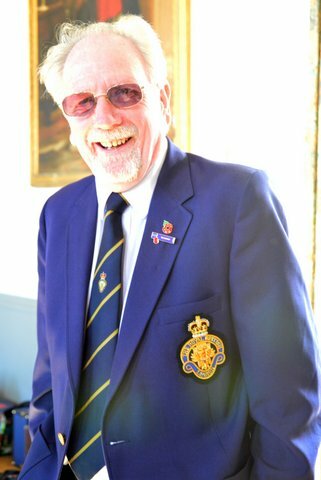 Branch Vice Chairman Steve Kingsford then related the story of Bombardier Arthur Thomas Withers, who had died of his wounds in 1918 whilst serving with the Royal Garrison Artillery, and had previously seen action in The battle of the Somme. Arthur Withers' descendants still live in the town. 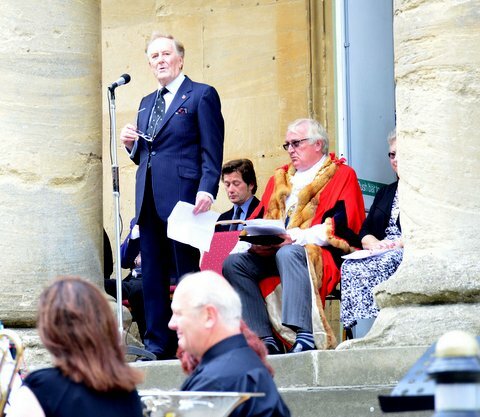 We were honoured that Robert Hardy, the actor and historian agreed to come along and read his favourite war poem “Spring Offensive” by Wilfred Owen, a memorable moment as his rich voice echoed around the square. 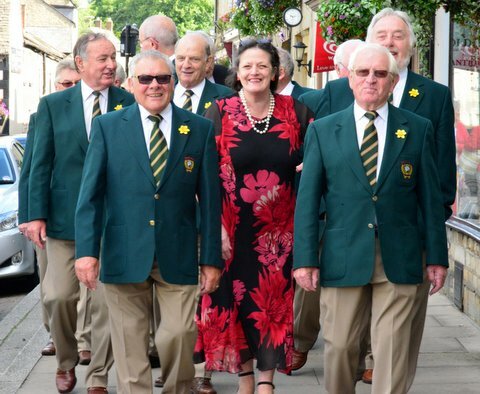 This was followed by more special guests, in the form of the Bryncoch Welsh male choir who had been performing in the town hall the previous evening, and kindly agreed to sing at our commemoration. Their first number was "Stout-hearted men". 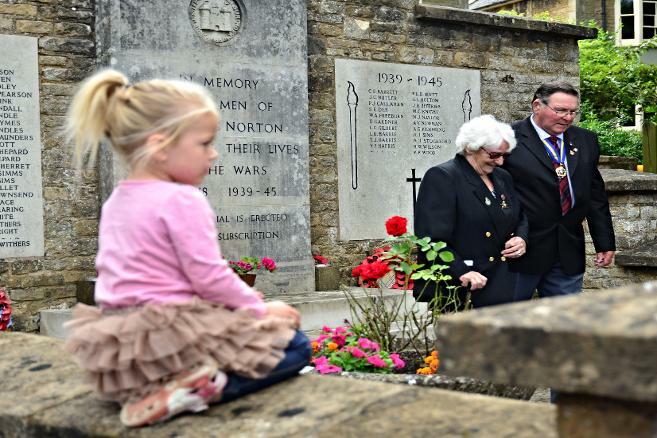 We then heard the story of Chipping Norton’s pioneer airman, Herbert Rutter Sims who died after being shot down over the Channel in 1916. 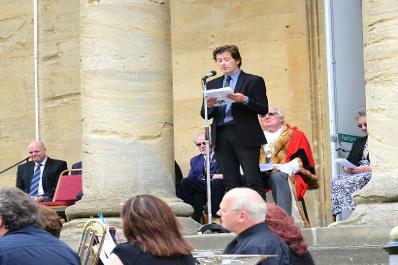 His story was read by local author Christopher Jory. The next item was a poem entitled “What of the women” by Edwin “Ted” Burbidge who had died of illness whilst training on Salisbury Plain. He was aged just 18 and had a book of his poems published posthumously. 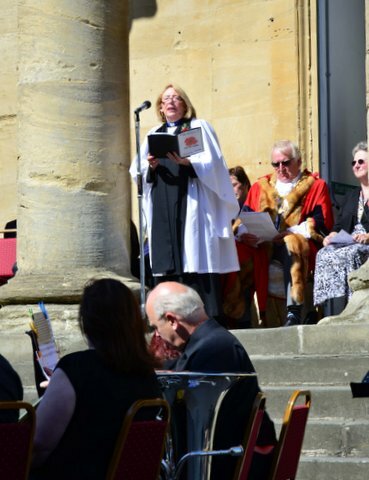 The poem was supplied by his great-nephew Paul Burbidge and read by the Reverend Jackie Jones. 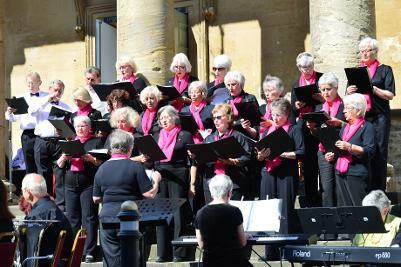 The “Accidentals” then returned with three more tunes beautifully played, including a version of “Land of Hope and Glory”. 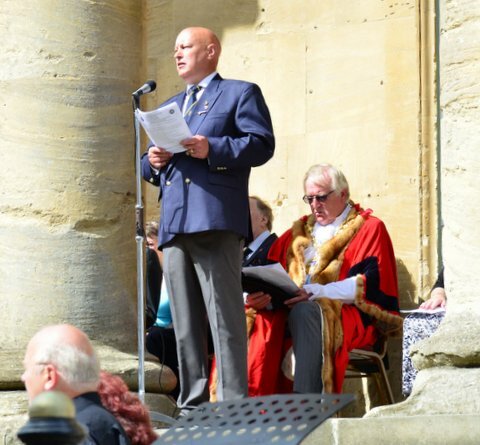 Branch member Trevor Hodkinson the read a piece entitled “They also served” which told the stories of men such as Charles Joines who gave his age as 48 when he was actually 59, to serve at home, protecting ports and railways. Trevor also told us of the 1st Battalion, Oxfordshire & Buckinghamshire Light Infantry who fought in Mesopotamia and were at the infamous Siege of Kut. Of the 400 men of the Ox & Bucks taken prisoner by the Turks, and mistreated, only 71 came home. Next we had another song from the Rhythm is Life choir “Your King & Country wants you, with the audience singing along to the chorus “We don’t want to lose you but we think you ought to go. 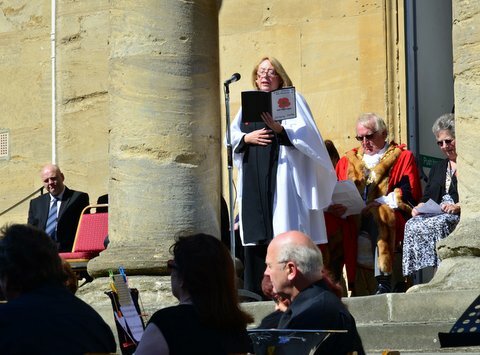 Then Janet Edgington read a poem by her granddaughter Tia, aged 14 called the “Darkness” which was showed great talent in in one so young. 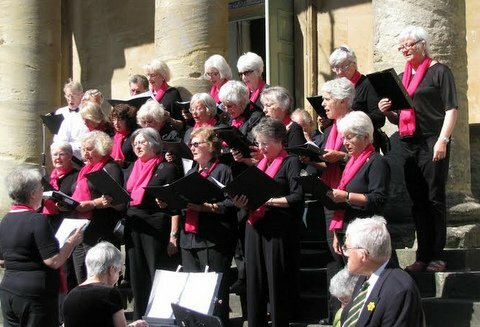 The Bryncoch choir then took the steps for a rendition of the Welsh hymn “Rachie” written in 1918, and a popular choice at Welsh Rugby matches. 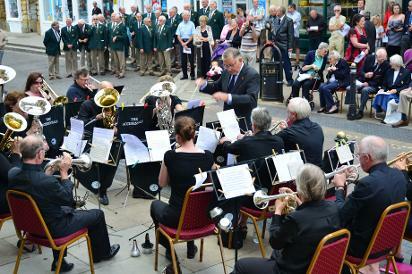 The Commemoration then closed with the sounding of the “Last Post” followed “The Ode” recited by the President of The Royal British Legion, Mr Neville Edwards. 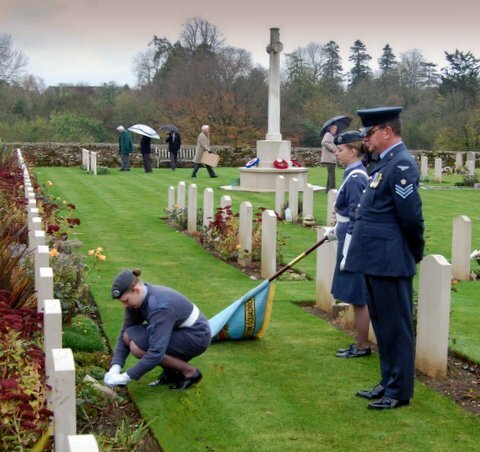 The bugle sounded “Reveille” and the proceedings ended with everyone moving away in silence. 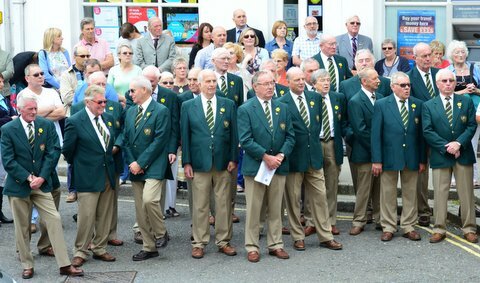 Members of the Legion and Town Council then walked to the town war memorial where a floral tribute was laid on behalf of the town by Mrs Betty Hicks, secretary and long serving member of the Legion’s womens section. Our Remembrance events started with a social evening at the Crown & Cushion on Thursday 8th November. Some 40 members and guests enjoyed a talk on the First World War by Alan Knowles. He gave an informative and entertaining account which explained and debunked some of the myths of the Great War. 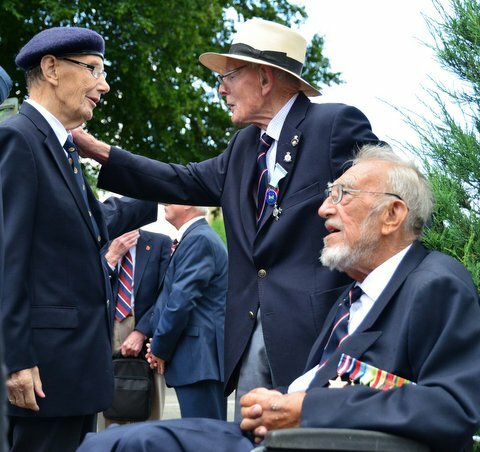 He reminded us that war was much more than mud, suffering and death and how through hard lessons learned the British Armed Forces, along with those from the Empire, eventually prevailed and won the war. 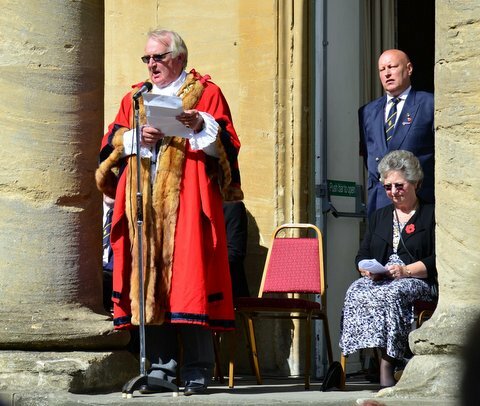 His message was that we should be extremely proud of all those that served, fought and died for their country, as well as shedding a tear for those lives cut short in the service of our Country. He also brought with him a Lewis machine gun and an Enfield rifle, complete with bayonet, which led to a number of Corporal Jones impressions (they don't like it up them). 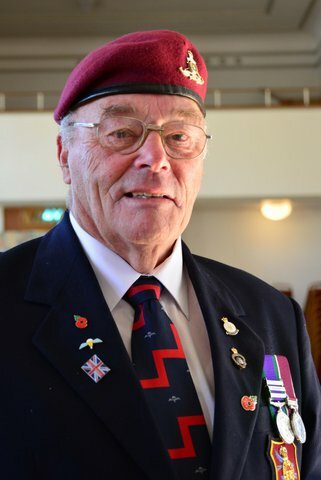 After our Poppy Collectors in town had been battered by winds and heavy rain on Saturday, only brightened by the return of our Poppy Appeal Organiser, Malcolm Holland, who had gone to Australia to ask why his boomerang hadn't come back, Remembrance Sunday dawned bright and fair. 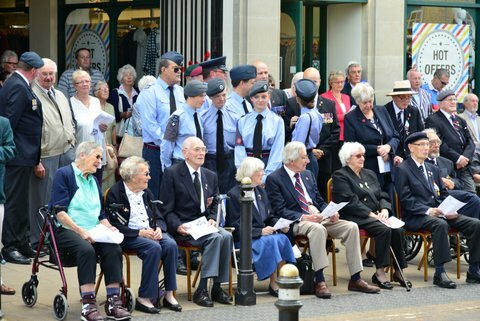 We knew that the parade would be bigger that normal this year, as our numbers were swelled by a contingent from 2624 Squadron Royal Auxiliary Air Force Regiment based at Brize Norton. 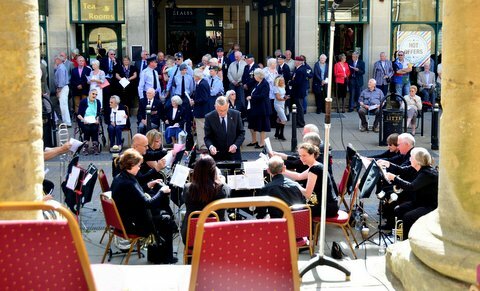 Led by the Bodicote RBL Youth Band we had veterans from the RAF Regiment and members of both of the town's cadet forces, Scouts, Guides and Brownies marching with us. After the march we attended the service in St Mary's Parish Church, which was full to the brim. 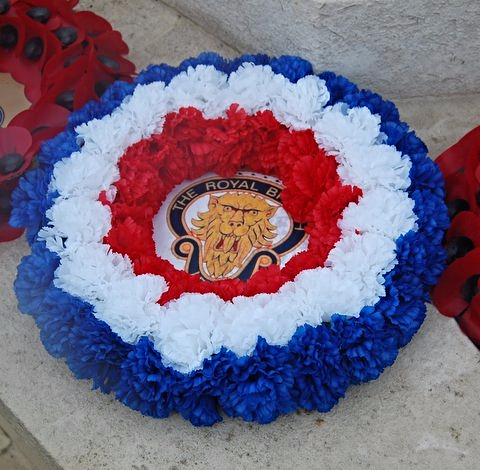 There were 27 wreaths to be laid before 1100, a mammoth task carried out with great dexterity by our Secretary Mike Dixon, assisted by Wendy. 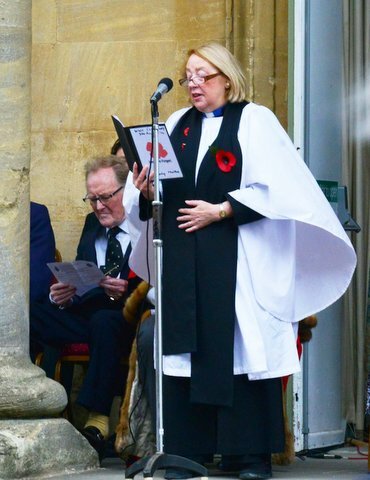 After the ode read by President Neville Edwards, the last post, 2 minutes silence and Kohima Exortation we had a very moving service led by our Vicar, James Kennedy. 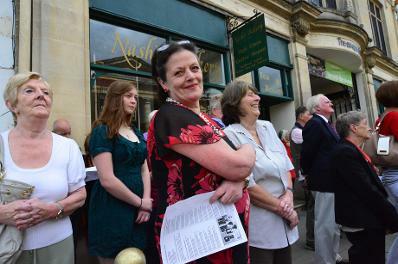 We filed back out into the sunshine and formed up to march back to the Town Hall, where the Mayor took the salute. 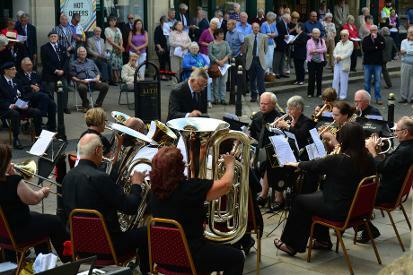 It was then we realised how well this year's parade had been supported with crowds of people lining the street. 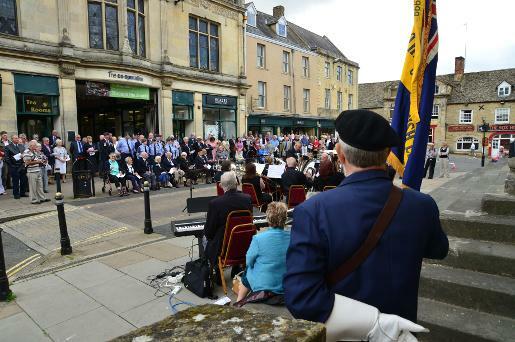 The parade lined up in front of the Town Hall steps to listen to speeches by the Mayor and the President of Chipping Norton RBL. 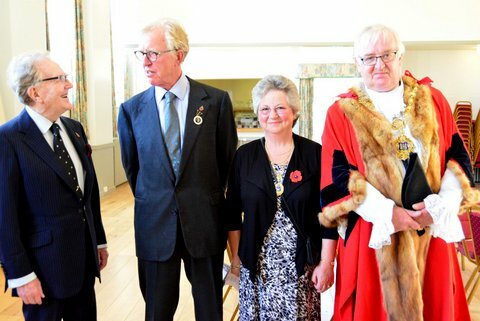 The parade was dismissed and was invited into the Town Hall for refreshments. 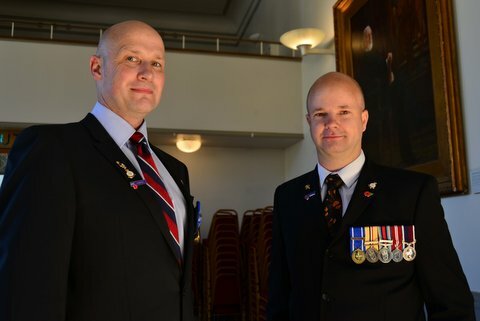 Before we could tuck into the beer and sandwiches, two presentations were made. An engraved tankard was presented to Standard bearer Malcolm Holland who was retiring from the role after many years sterling service, he will, fortunately, remain our poppy organiser. 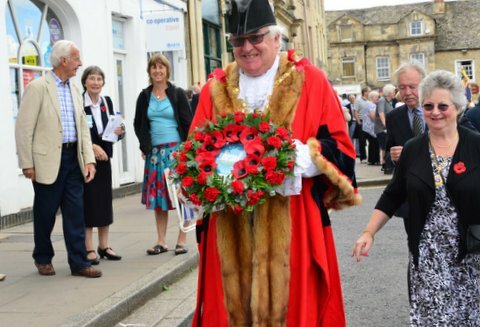 The other was a Poppy brooch to the "yarnbomber", who is responsible for the wonderful knitted poppies that adorn the town. 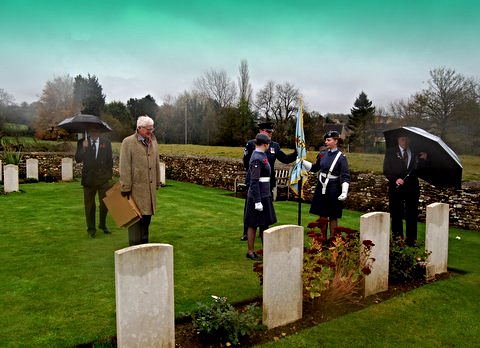 On Armistice Day, Tuesday 11th November, the weather, as it always seemed to, changed to cold, wet and windy. A warm welcome, however, was given to us by the staff and children of the Holy Trinity Catholic School where we had been invited to attend the morning Remembrance assembly. We were given a guided tour of the school by the prefects before taking our seats in the assembly. 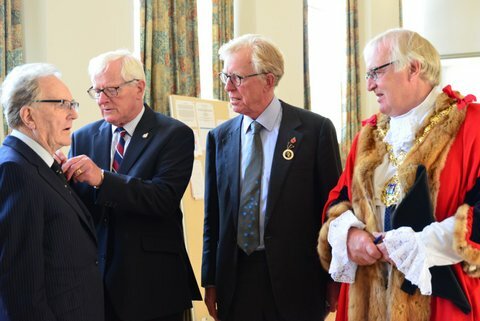 President Neville Edwards talked of the Legion's work and the significance of the poppy and vice-chairman Steve Kingsford spoke of those from the town who served in the First World War. The children listened attentively and there were hymns and poetry too. The children sung beautifully, making a most moving service which brought a tear or two to the eve of at least two of us. 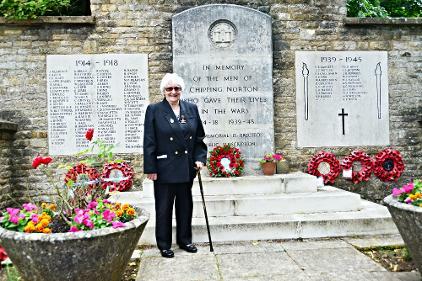 After this it was back out into the cold for our annual Armistice Day service at the Town War Memorial. We were joined by year 6 children from the school and by Father Mervyn of the Holy Trinity Catholic Church, The Very Reverend Canon Mervyn Tower to give him his full title, who had led the prayers earlier. We were again blessed with an excellent turnout. After the service at the war memorial our Standard Bearer and some members of the branch went to a service at Over Norton War Memorial, which will become a permanent feature of our Armistice Day remembrances. Another party made the now traditional trip to Little Rissington Churchyard to lay a wreath and crosses of the graves of five airmen and one air cadet that were killed in crashes in and around the town during the Second World War, and now lay in this beautiful and peaceful spot, among 43 other servicemen. 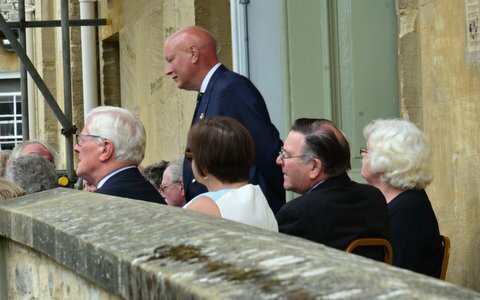 With us came Canon Robin Howard who was with us on the 70th Anniversary of the plane crash in 1942, three of those who died rest here. 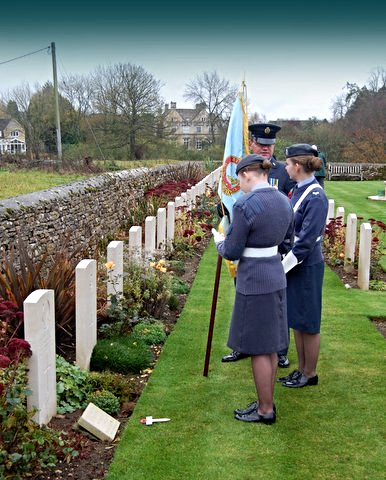 We were delighted that two air cadets with their standard and Sergeant Tony Pick from 136 Chipping Norton Squadron were able to join us.